After attending the Anti Imperialist Camp in Assisi, we had some free time to tour Rome, the heart of the dead Empire. What is more Roman than the Colloseum? As faithful and bored tourists we went just there and spent some time reading the presentations about its history on the site and in Wikipedia. As we were hoping around the impressive remains of the Roman architecture, reading about the generosity of Emperor Titus, which contributed from his own share of the bounty from repressing rebellions in Palestine and elsewhere to build the huge stadium to entertain the Roman public, we came across an estimate of the number of people that were executed in this place to keep up the public’s morale: some half a million of the poor wretched Gladiators and other human prey. This extraordinary cruelty, mostly made for pure fun, used as political bribery to the Roman public, requires some explanation. In the old course of Historic and Dialectical Materialism we learned the notion of “Super Structure”. Such structures are built to serve the mode of production, to enable better living conditions to members of the Human society. Later these super structure entities may acquire their own logic and do enormous things that are out of their original useful functionality. The example that was given in the course was the Egyptian Pyramids. As the population in Egypt relied on agriculture in the dry lands around the Nile river, there was enormous benefit in a centrally organized irrigation system. Building such huge public works projects required scientific planning (i.e. well learned experts) and the ability to mobilize thousands of peasants to work systematically in public projects. The result was the establishment of a centralized state with its god kings, the invention of Hieroglyphs writings and much more. The system succeeded so much that it celebrated its achievements and showed its capabilities by mobilizing tens of thousands poor peasants and slaves to build the useless Pyramids. Rome was not basically a public works project but an empire. Its specialization was mobilizing people to fight and conquer lands. An important part of it was to enslave people to do its work and fight its wars. The celebration of its achievements and excellence in this “vital task” was through the establishment of the Gladiator’s profession and the display of its perfection to the public’s joy. It is easy to find contemporary Super Structures that extend beyond their functional necessity and create their marvels or horrors. You can mention the expensive flights to the moon and beyond that come out of the building of technological super powers. You can see the military-industrial complex of the empire building the ability to destroy the whole world multiple times or spending endless billions to develop fighter aircrafts that will probably never be used. But the most useful critical analysis of the self extension of Super Structures comes when those structures not only outdo what they were planned to do, but actually acts against the function that they were built to serve. One example is the Roman legions that occupied and destroyed Rome on the fifth century. But present day Israel is a very good example too. Israel was established, built, armed and kept military superior as part of the structure of imperialist hegemony of the Arab East (and beyond). You may assume that one of the goals of this hegemony is to enable the imperialist powers to buy cheap oil. So when Netanyahu is waging his verbal campaign to threaten the world with another Middle East war – this time against Iran – and causing petrol price to jump all over the world – his imperialist masters should be asking themselves why the hell they should continue to pay his bills. More than that, the basic idea of holding Israel as a stationary imperialist Legion in the middle of the Arab East was to save the imperialists costly direct military intervention to prevent Arab independence. So when Israel drugged the imperialist powers to the costly Iraq war in 2003 it was already overplaying its hand. Now they want another, much bigger and costlier, imperialist war on Iran. And this is before they start even thinking of the strategic implications of the Arab revolution that is freeing the Arab people from the servants of imperialism and local tyrants. Out of date and out of control Super Structures may be very costly – in money and human lives – also to those that used them to subdue others. Of course, it is none of our business, as the oppressed people, to care for the internal problems of the oppressing system. But we also shouldn’t be blind to its internal contradictions – which might provide our best opportunities for liberation. It is high time to dismantle the Golem and free the Gladiators with the enslaved. It was a winter night, 03:45am, and I was going fast on the Wadi Milek highway north, crossing a small forest, when I saw a Jackal trying to cross the road just in front of me. I was fully alert, so I slowed the car to let him cross safely. But then, when he was caught in the flushing light of the car, he forgot all about crossing the road and turned head-on to meet the commanding approaching mass. He was fascinated by the light, and as he lost control of his free will he met his inevitable death. For a long time now, as we are all approaching the next Middle East war, I feel that we, the future victims of this war, are very much like this poor jackal. We are fascinated by the big thing that is coming just in front of us. It controls our minds, so we can’t think of running away. By controlling the agenda, the approaching war is making the disaster inevitable. Does this mean that I believe Israel is really going to attack Iran? I don’t know. As a civilian leaving in the designated firing zone of the next planned war, I have no idea what is in the mind of the ruling military clique. All I know is that the generals who are preparing for the war are only counting their fire-power, their planes and missiles. For them the civilians that might be caught in the cross-fire are just a nuisance. All they need to win the war is shut them up or ignore them. But the failure to resist the approaching war is not only on the side of its powerless victims. Netanyahu, at the head of the Israeli leadership, is clearly going out half-drank, tearing away his shirt and shouting out aloud, determined to show the whole neighborhood who is the real man. In our neighborhoods we know such hot-heads. They have something to prove, and they might be dangerous. But people here know also how to put down a nasty fight. It is up to the good friends of the run-away bully to embrace him, calm him down and carry him home. Later he would be able to tell everybody how he could have “showed them” if he was not dragged back by his friends. Instead the imperialist friends of Netanyahu are doing him bad service by encouraging him to keep on threatening, and push a shove of themselves at Iran. With such friends things can easily get out of control. But the real thing is not the war on Iran. The war on Iran is only a prelude – because what is the issue at stake? 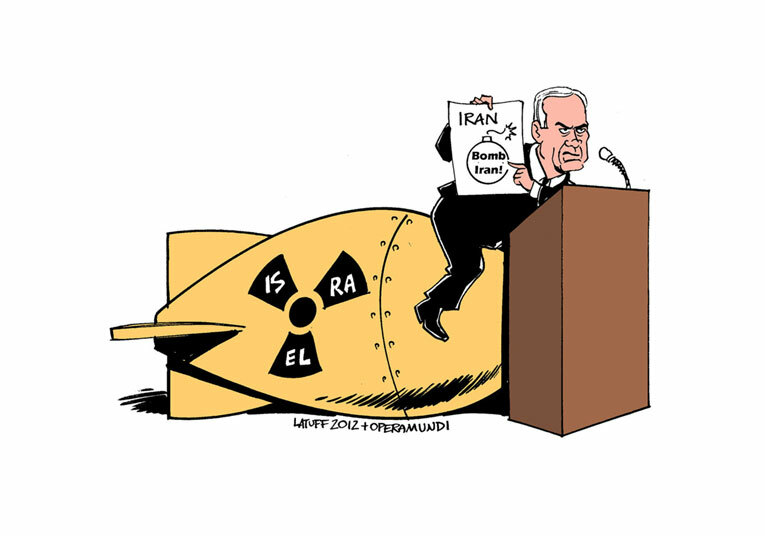 The point that Israel and its imperialist friends are out to make is that Israel should keep its position as the only country with nuclear weapons in the region. What they want to make clear is that Israel has the right and the capability to kill tens of millions of Arabs in order to “defend itself”. But, as Israel was established by the ethnic cleansing of Palestine, actually the nuclear deterrent of Israel is the ultimate separation wall that is designed to prevent the Palestinians from coming back to their homes. Many top Israeli politicians described in their memories how close they were to using the doom-day option in previous wars. So, what is really hard to grasp, is how some Arab regimes are joining the anti-Iran camp, defending the right of Israel to burn the Arab World.